While patiently awaiting the return of my Juki, I started work on a new series. It started out with inspiration by this weaver. 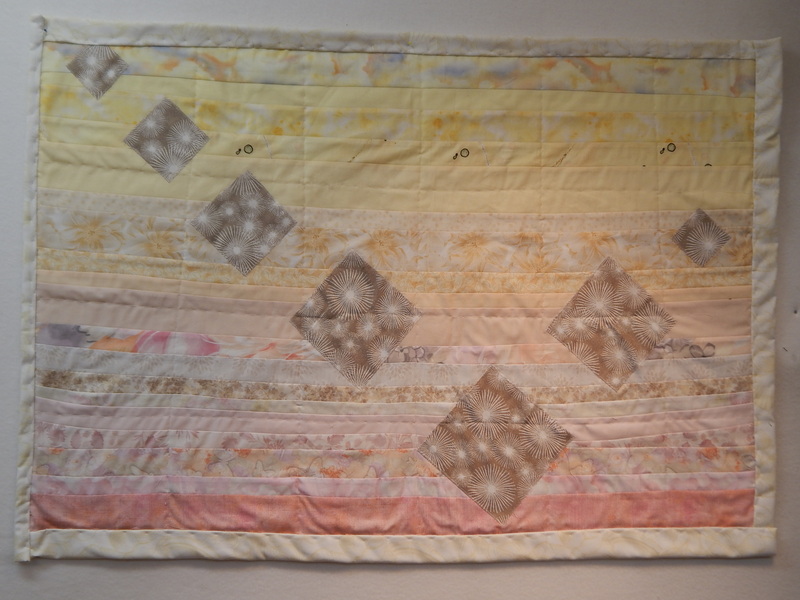 The more I looked at her work, the more I saw the “quilty-ness” of it. Then I started drawing little sketches in my journal. 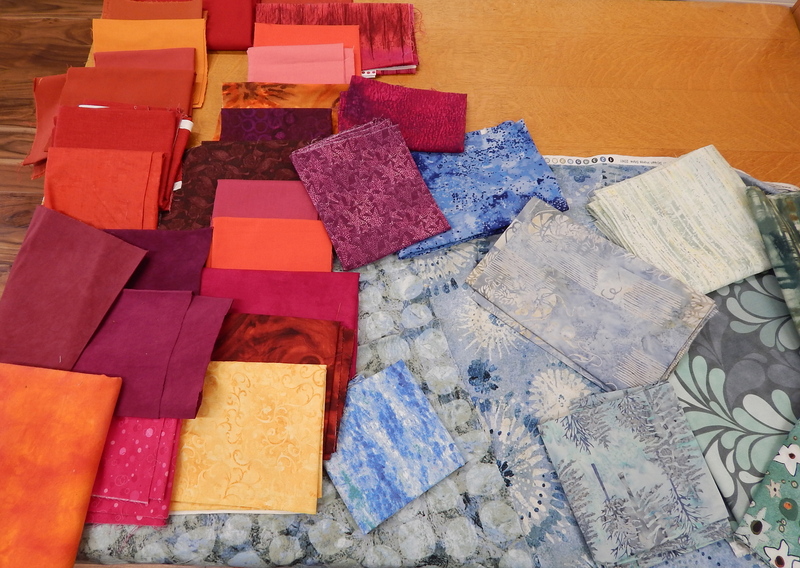 And I decided to let myself play with my collection of hand-dyed fabric–some Cherrywood, some Ricky Tims’, and even some of my own hand-dyes. These are all really simple designs. 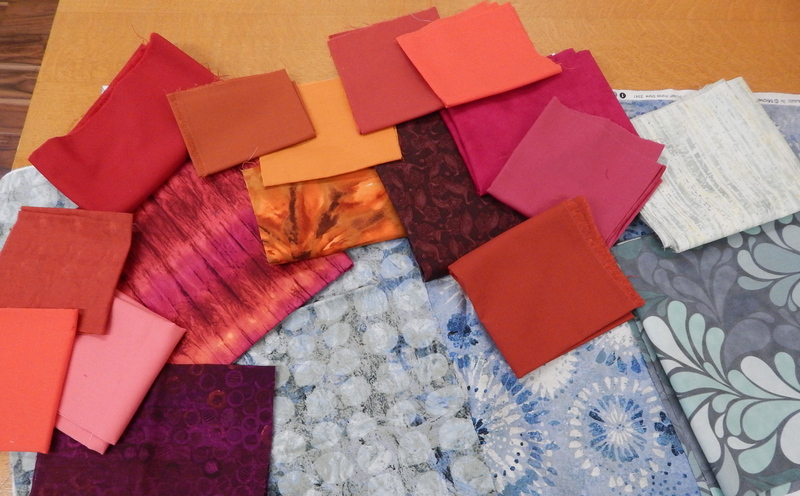 But I enjoyed creating them, and choosing “just the right colors” for each. 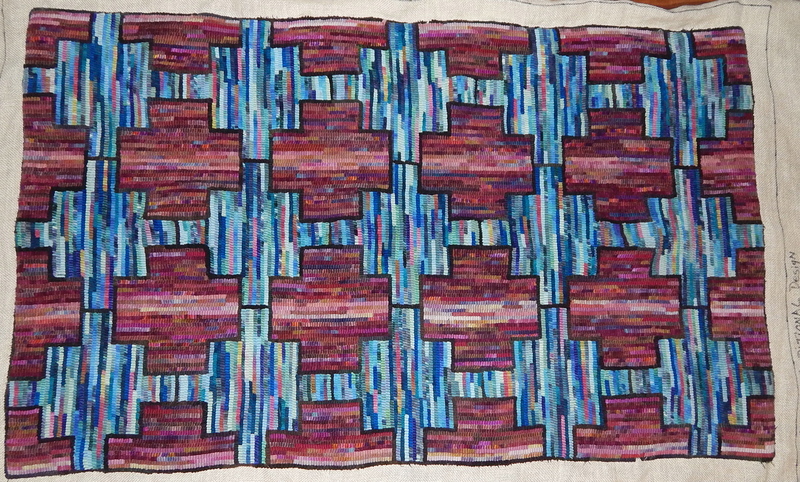 The small pieced squares that I am using in each were created on my Colorado retreat! I am going to use these pieces for a series on “the character of God.” I wanted to use characteristics that most people could relate to. And then I found an article where the author made two lists–one of characteristics that applied only to God, and the other of characteristics that He shared with man. That helped to define what I was thinking about. 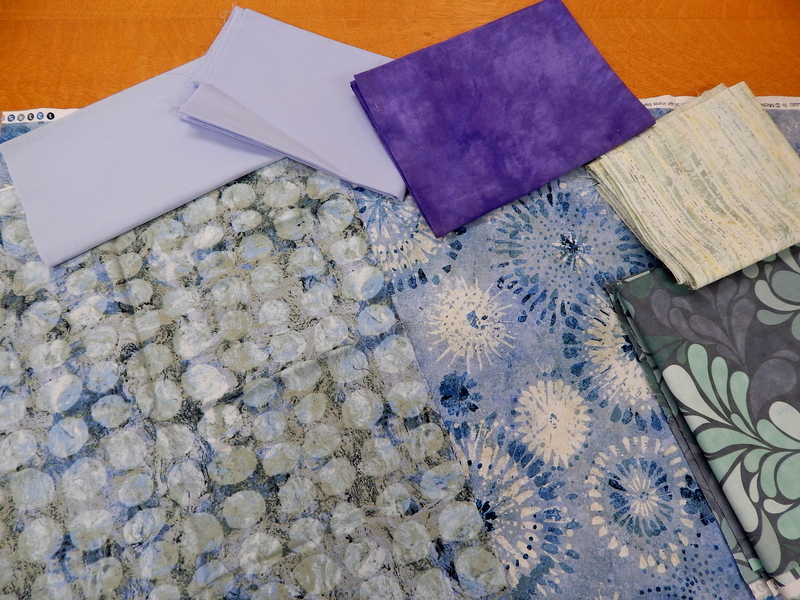 So although they are simple, they also provide a somewhat blank canvas that I can use to embellish with quilting or embroidery just the way I want. P.S. Just got word that my Juki has been shipped! Yahoo! 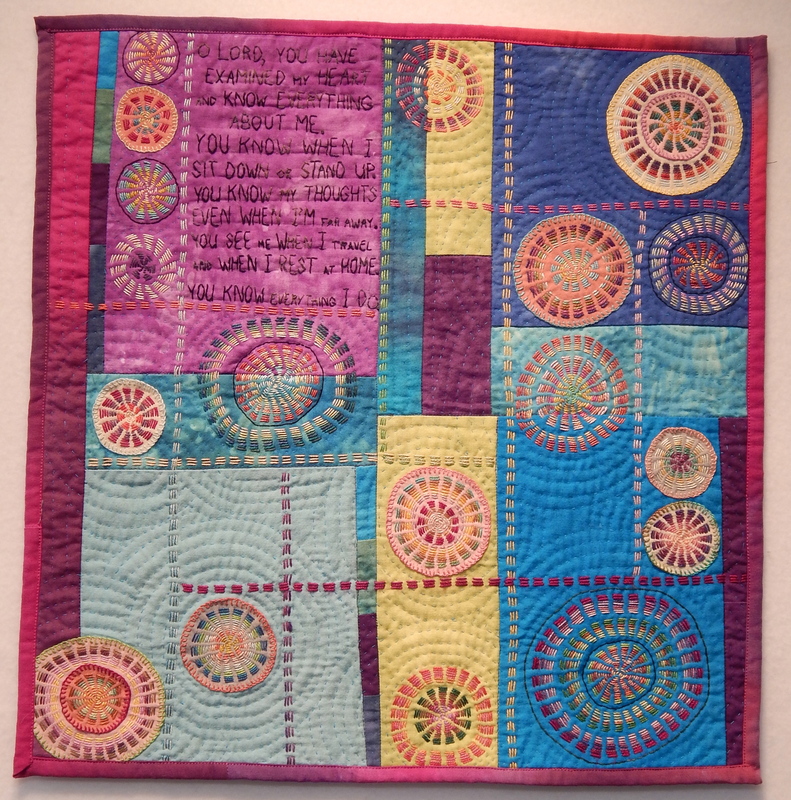 A week or so ago, I became enchanted by a quilt Melody Johnson shared on her blog. I sent the picture to my BF, and asked why I liked it so much. Her answer: P.I.N.K. Ha! I truly hadn’t thought of that. I do like pink just a bit 🙂 I also liked the scrappiness of it, and lately I’ve been attracted to the friendship star. I’ve been thinking about triangles for about 6 months. 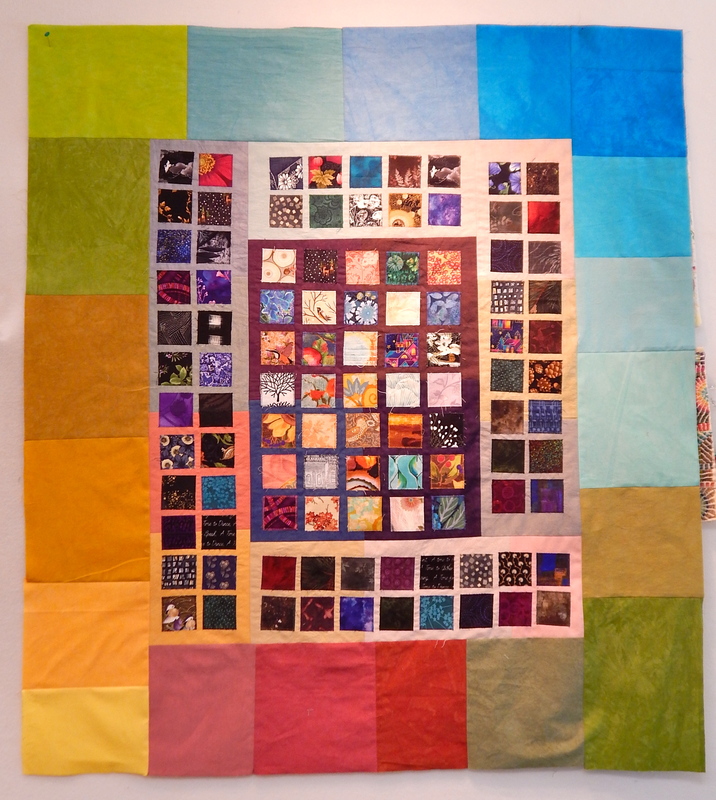 And I have been thinking about doing a more traditional style of quilt. P.I.N.K. confirmed it. This is the new quilt I would make for my bed! 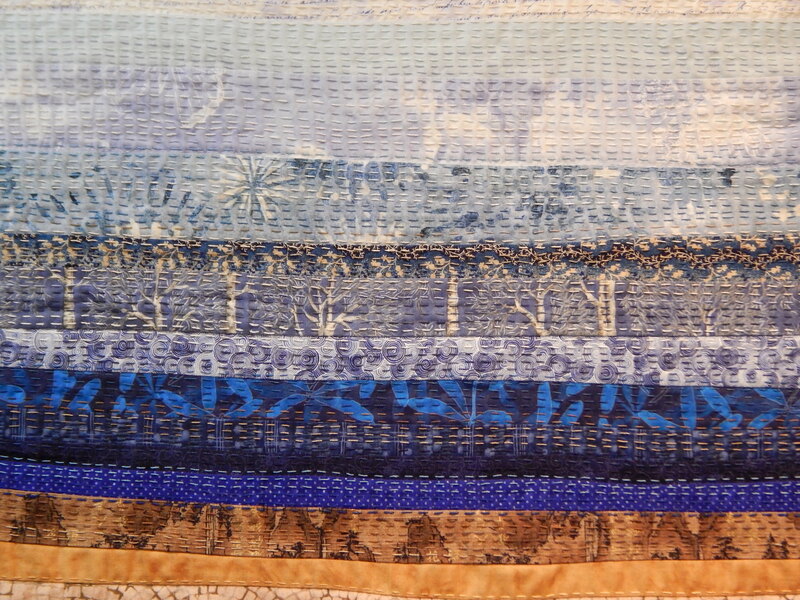 Oh, and I also liked that the original creator used old clothing in her quilt. 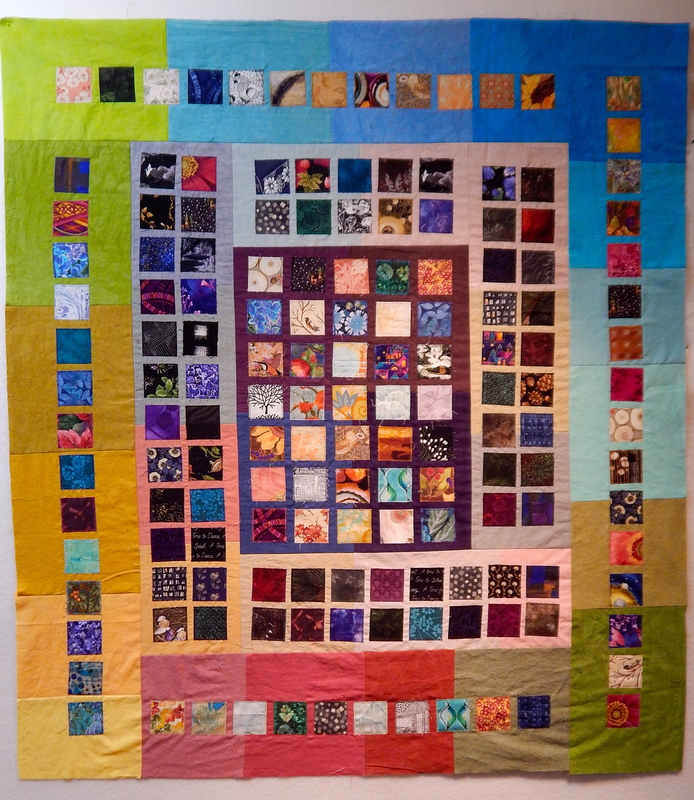 I had saved some of the fabric from the last few colorful scrub tops I wore as a NICU nurse, and this would be the perfect quilt to include them in. 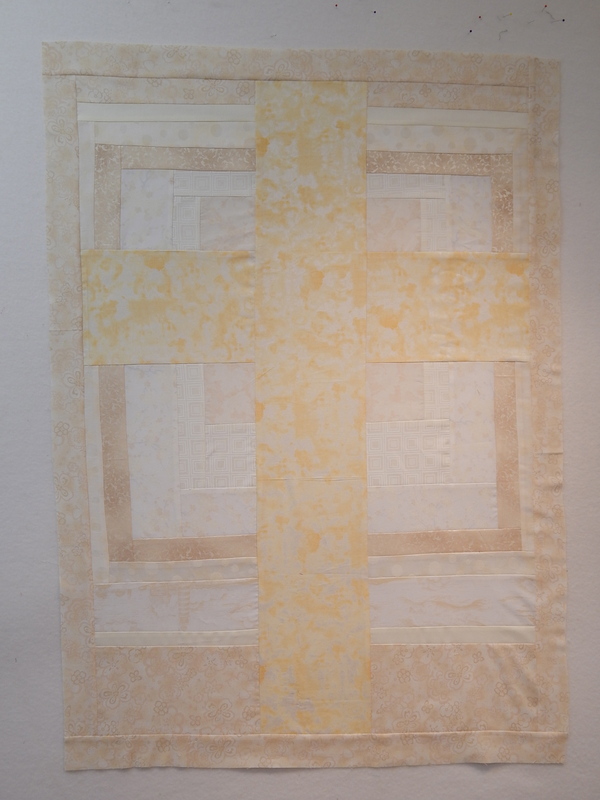 As you can see in the original, it is based on 3/4 –that is, there are 3 squares across the blocks, contrasting to the 4 squares across the sashing. The simplest equation for this is 12. 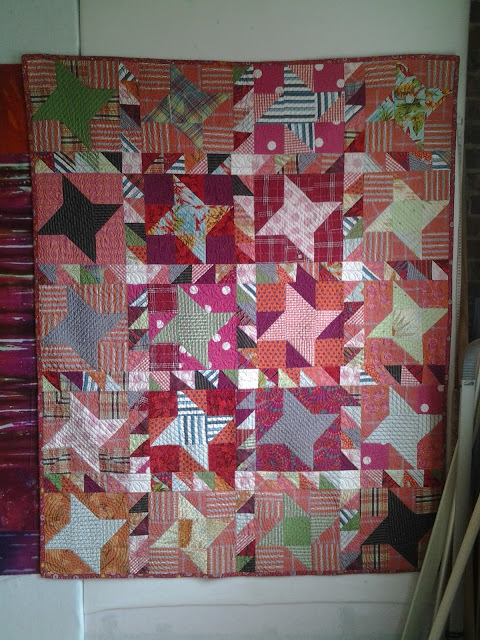 So the blocks are based on a 9 patch of 4 inch finished blocks, while the sashing would be based on 3 inch finished blocks. I only tell you all of this to tell you something cool that happened quite by accident. I decided to make the half-square triangles for the star blocks by simply cutting 4 1/2 inch blocks, drawing a line down the center, and sewing ON that line. I cut the leftovers off with my scissors. As I looked at those leftovers, I wondered if they would make the 3 inch finished blocks I needed for the sashing triangles. Sure enough, they did! So I sewed those leftovers together as I went along, and then “squared them up” and cut them down to 3 1/2 inches. 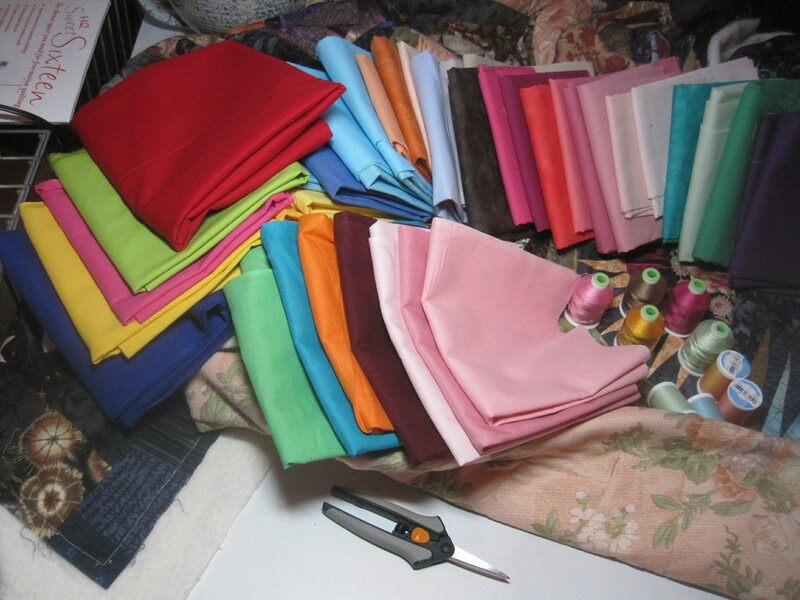 I do not like strip piecing, or speed sewing anything. So I just went through my stack of pinkish fabrics and chose three fabrics for each star block, and constructed each block one at a time. I know this is slower, but I am so much happier working this way. Every day I made a few star blocks, so that by yesterday I had all twenty of them done! I was a little surprised to see that my creation is LESS pink than the original. Maybe it’ll pink up when I add the sashing. 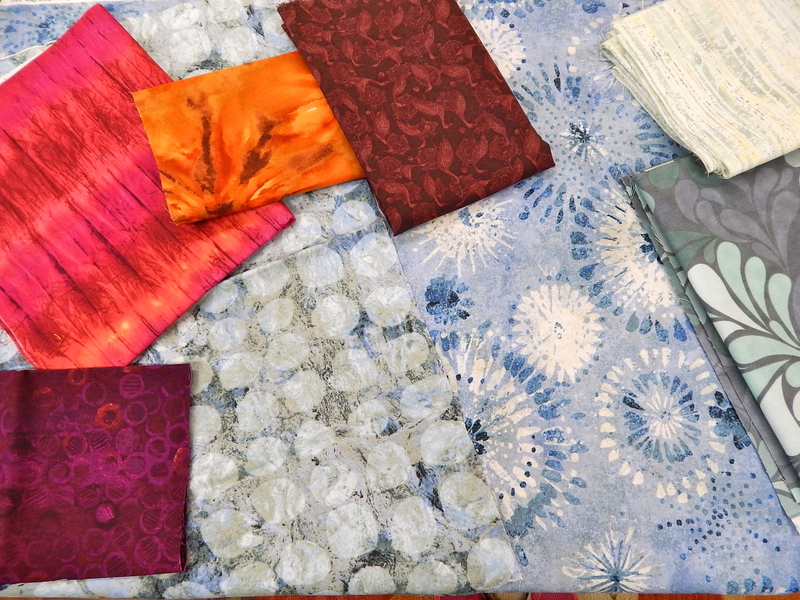 I used a combination of contemporary prints and reproduction prints. And added in some stripes and plaids. This will not be big enough for a bed quilt, so I will add some kind of border. I hardly ever work so continuously on one project. But I really enjoyed this one. Yesterday I put a facing on it, and TaDa! It is finished! The title is “Seeing God.” I love the verse that inspired it: For ever since the world was created, people have seen the earth and sky. Through everything God made they can clearly see his invisible qualities–his eternal power and divine nature. In between stitching, I spent a bit of time in the studio piecing two more tops that I want to do a lot of embroidery/hand stitching on. Here is the “pink” one. The verse inspiration for this one is: Every good thing given comes down to us from God our Father who created all the lights in the heavens. I took a picture of this top with the pink threads next to it, so you can see it will be a little more dynamic once the thread work is added. 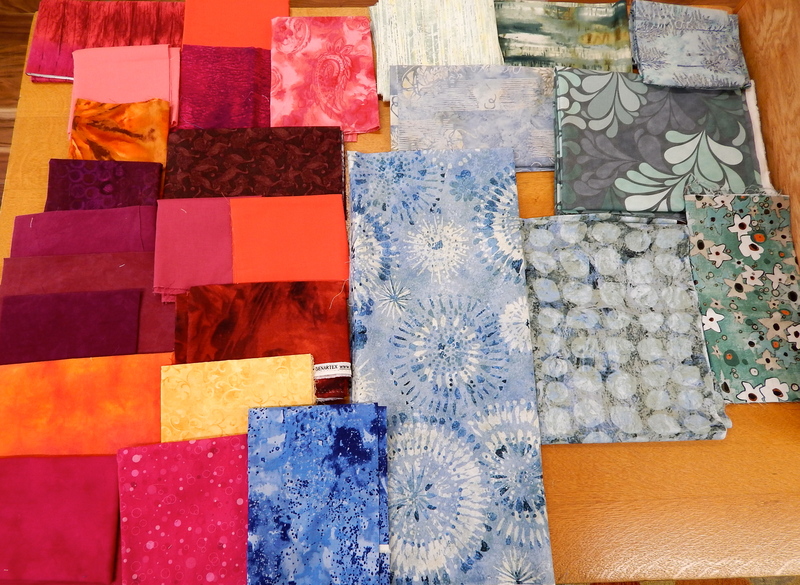 And here is one where I used my box of little two inch squares and my bags of Cherrywood hand dyed fabrics. I love those bags! They sell pieces of a large cross section of their hand dyed colors cut into about 8X10 inch pieces. 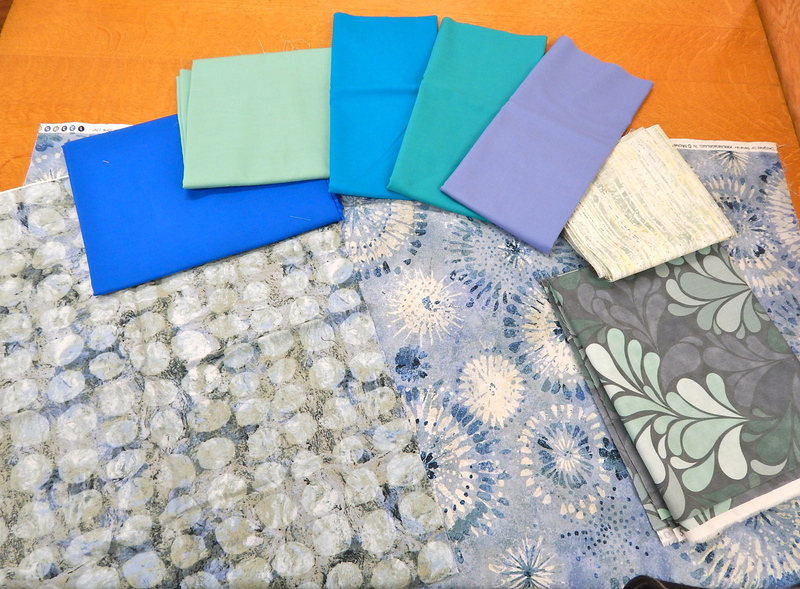 There are lots of things you can do with an 8X10 piece of fabric! 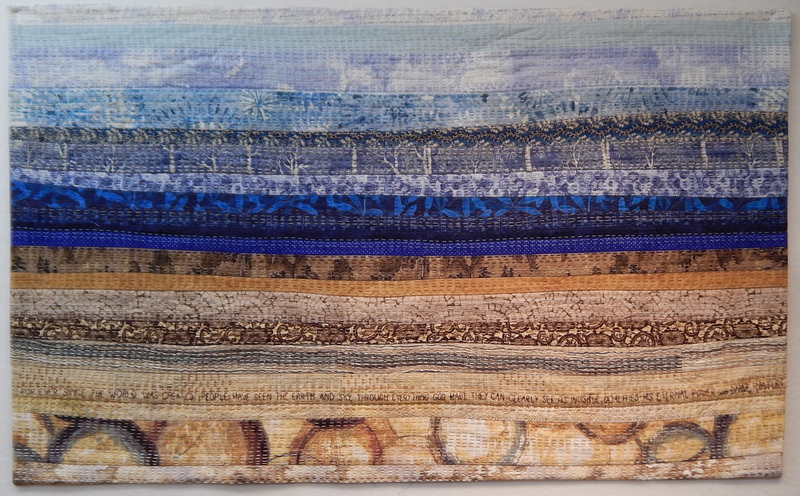 Anyway, I got this far, and I can’t decide whether I want to put more 2 inch squares on the outer border. I love the brighter colors and the glow that they achieve. So many times you get a new idea, and the idea is so much brighter and shinier than what you are actually able to create. This was a very simple idea, simply executed, and to me, it looks just as good as, or better than, my idea. 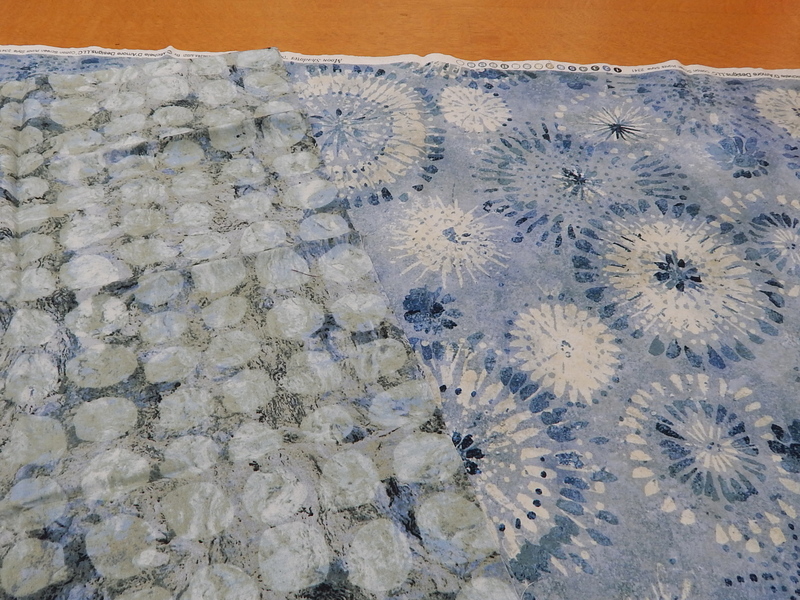 I have been stitching on it non-stop since my last post, and have only stopped long enough to work on another strip-pieced top to highlight–guess what? 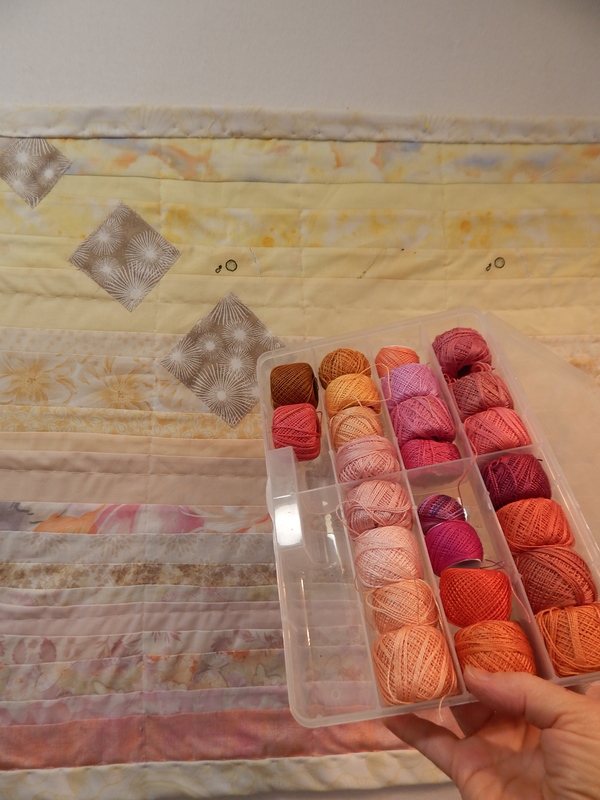 My collection of pink and coral threads 🙂 I am thinking about adding a bit to this piece besides the simple strip piecing, so it is sitting on my design wall while I cogitate on that a bit. So fun when one idea takes you in a new direction. And that direction turns out to be something that pleases you both aesthetically and tactile-y. This straight line stitching is easy on the hands, and the only decision I have to make is which color of thread to use next. New work–in more ways than one! The studio is progressing rapidly. This time I wrote a post over on my other blog. You can click here to see the latest pictures of the construction and progress. And in the midst of all the cleaning and clearing, I decided I had time to start a small piece for a SAQA exhibit. It is only supposed to be 7″X10″. Surely I can finish that before January 31st? 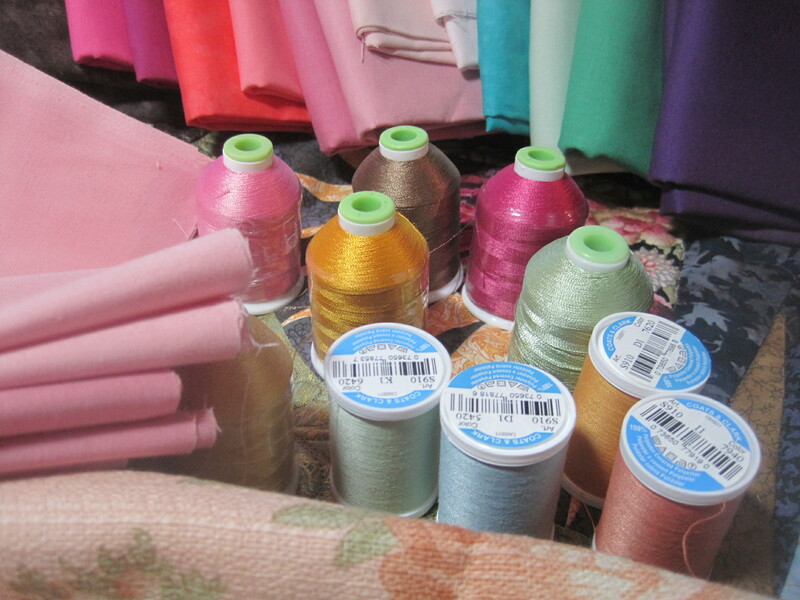 Well, almost all of my fabric had been organized and put out in the storage shed. 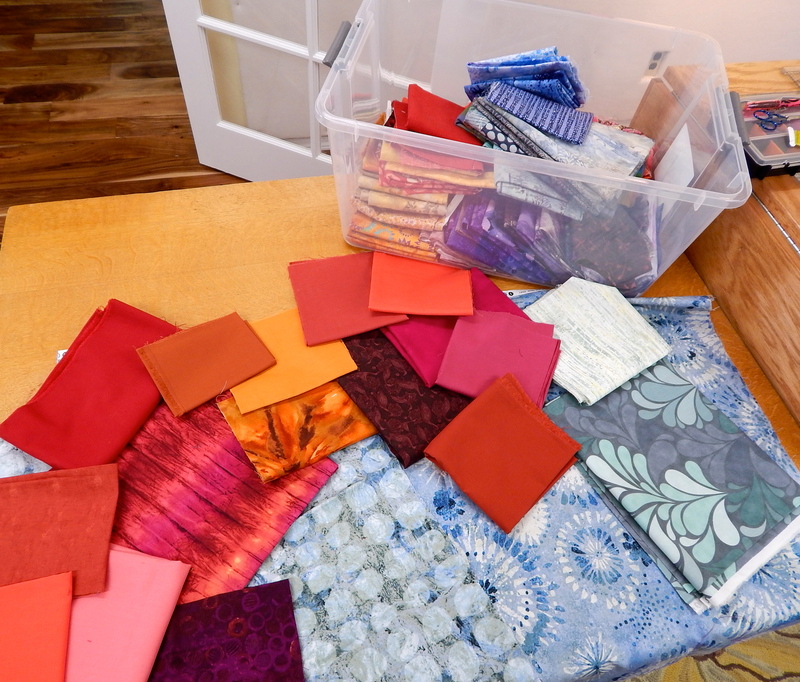 There was just one last pile to organize and clear up, and as I went through those fabrics, I put aside a small pile that I thought might work for this piece. 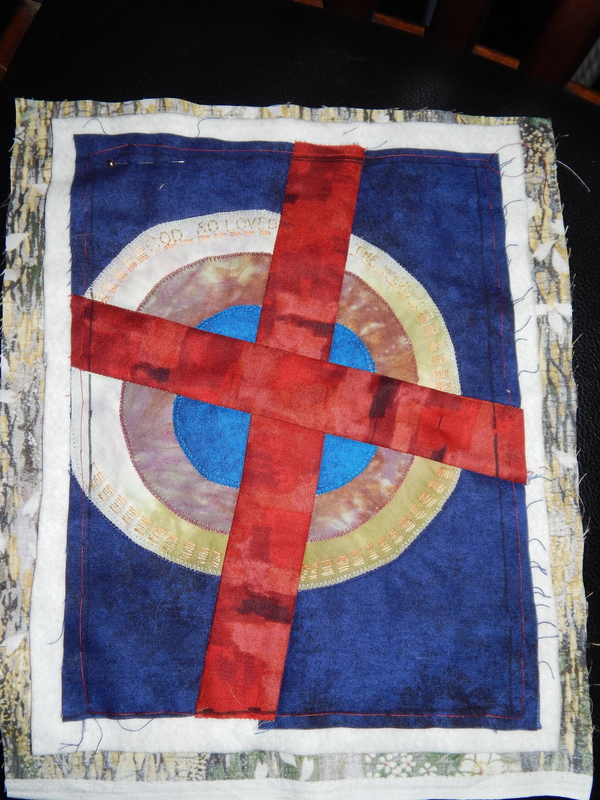 In the end, I decided to do another in the “Signature of Jesus” series, combining the cross with the kantha embroidered circles that everyone loves so much. When I went out to the storage shed to see if I could find my thread, it was the first container I saw, right inside the door! I think that’s providential. One of the hardest things was to figure out how to make sure it was only 7X10. 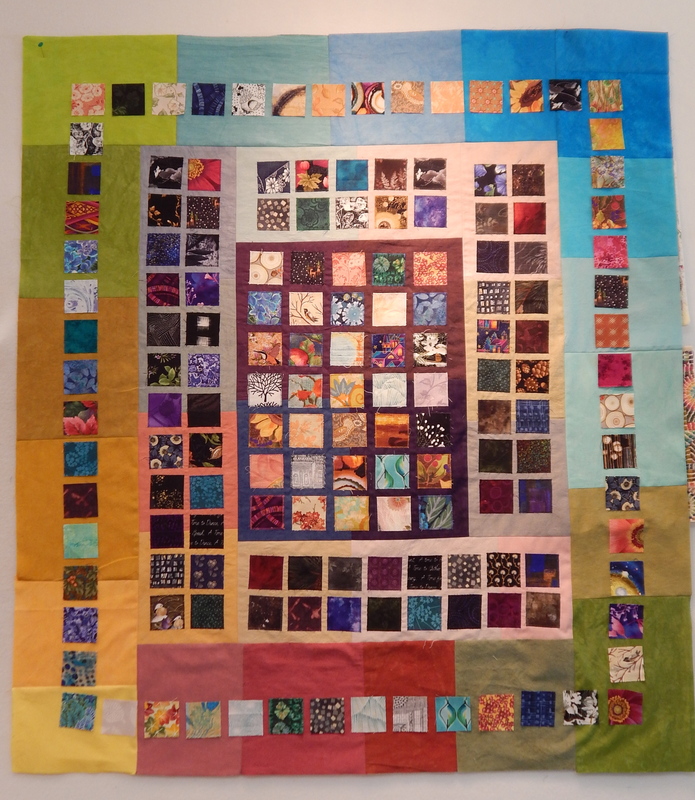 I made the top, and then cut it down a little, and then I marked that black line at 8X11, so even if there is a little shrinking with the stitching, I at least have a guideline to know where the quilt will end. 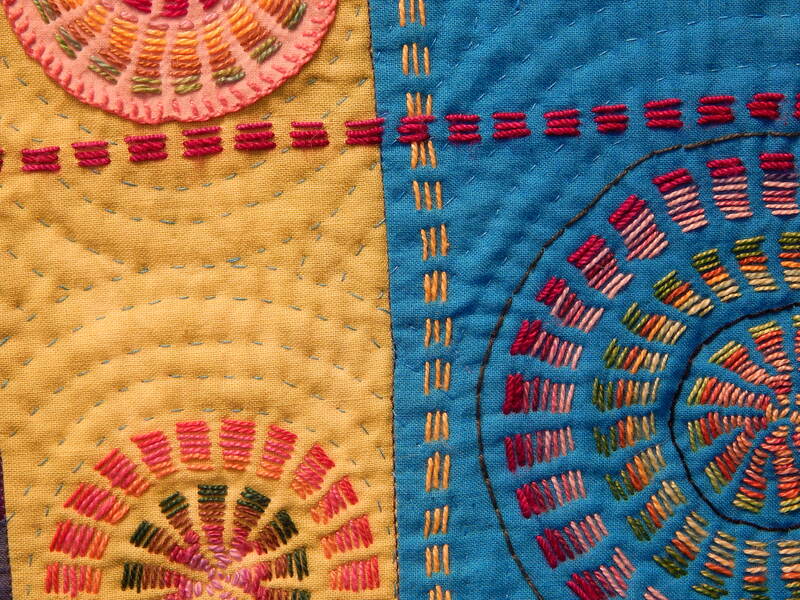 This is the first time I included words within the circle stitches. I like it very much. 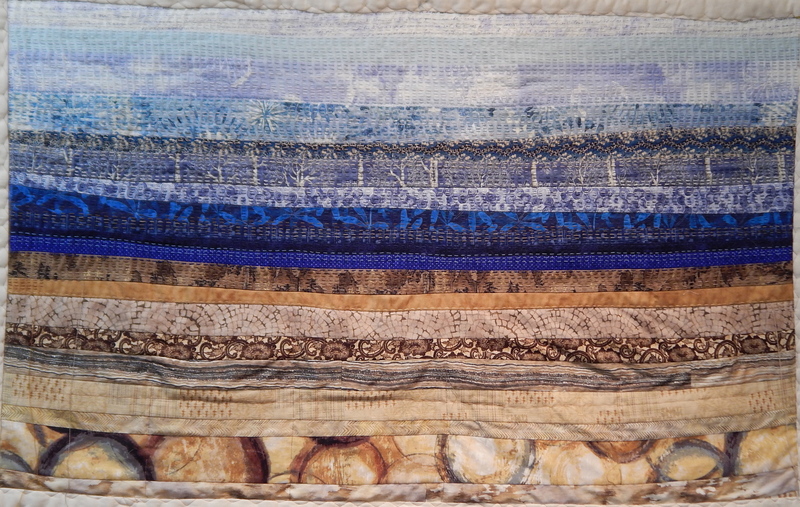 I have a lot more embroidery to do, and then some more quilting. But I think its doable, don’t you? It makes me happy to have little moments of creativity in the midst of the building and cleaning havoc. 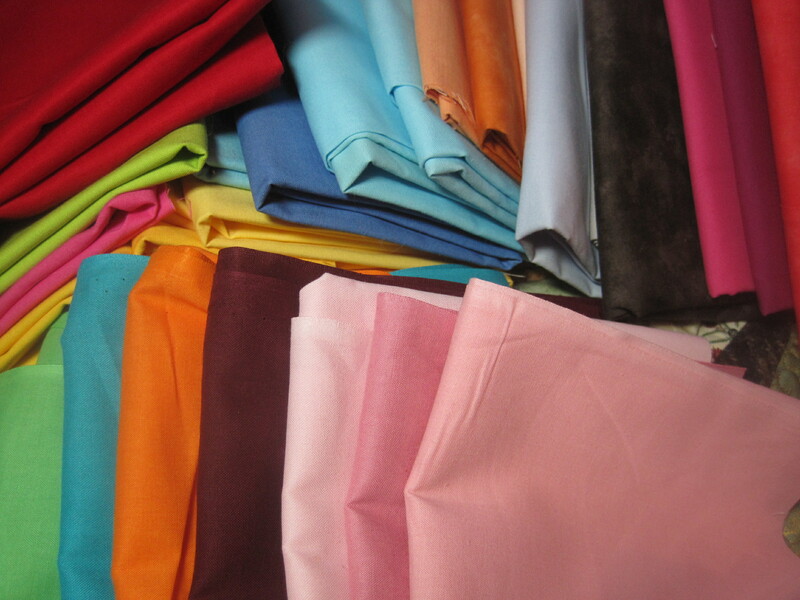 Solids…What Are They Good For? I dunno. But I guess I’m gonna find out! Over the years I’ve been attracted to the work of artists who work with solid colors. So I would pick up a few solids here and there. 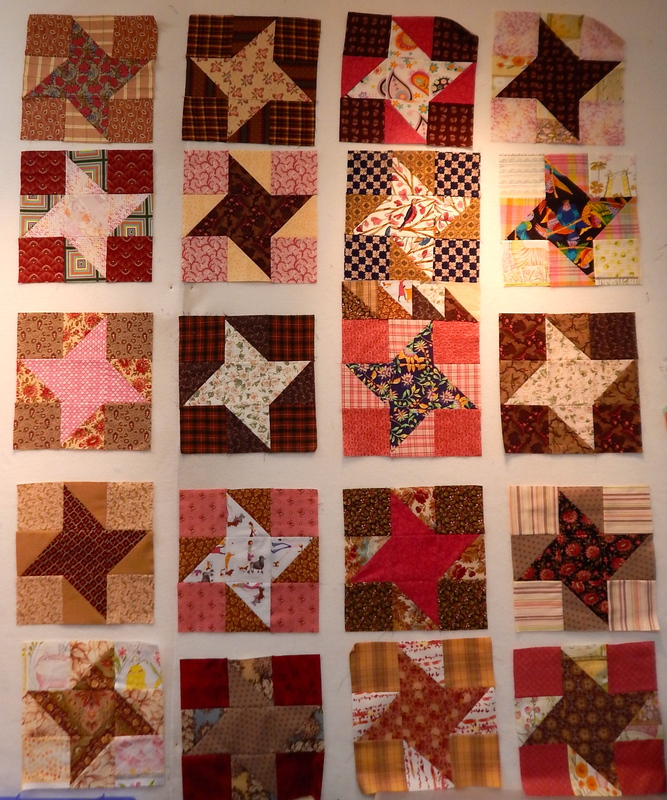 And of course there’s the wonderful Amish quilts. And then I started reading Melody Johnson’s blog. And she kept encouraging you to get more solids. She would even tell you when Joanne’s was having a sale on solids. 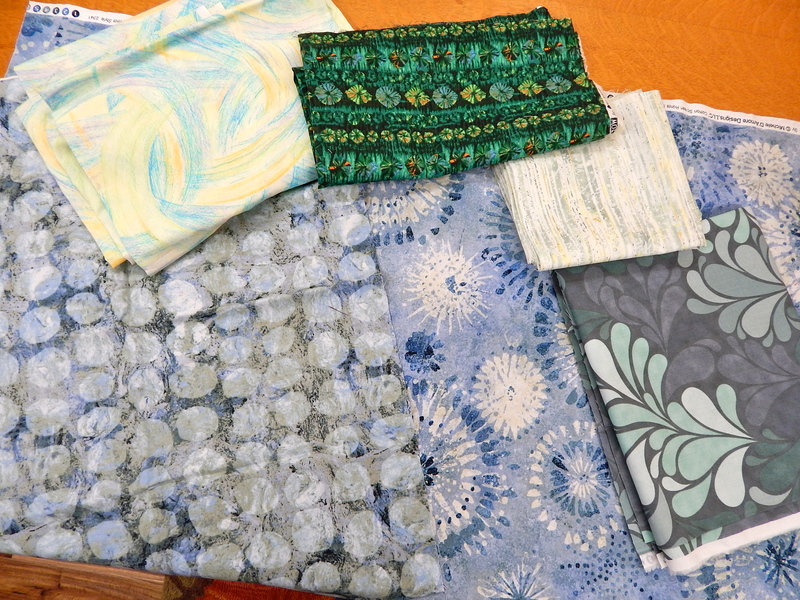 I am not putting these solid fabrics away until I do SOMETHING with them! 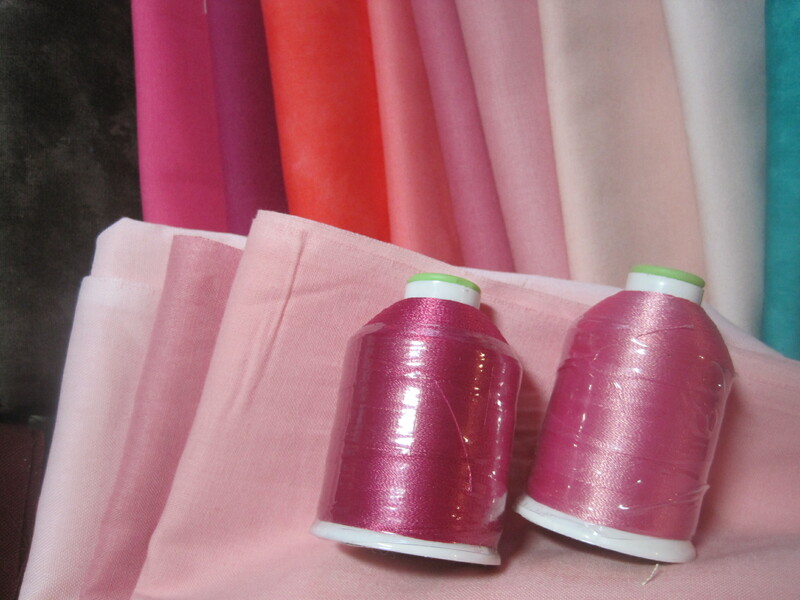 Did you know my favorite color was pink?